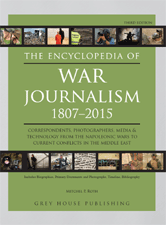 The Encyclopedia of War Journalism, 1807-2015 examines the development, history, and current state of war journalism. New article entries include Al Jazeera, Anderson Cooper, YouTube, Kidnappings, Post-Traumatic Stress, and much more, focusing on women journalists, modern conflicts, significant new media and organizations, the way in which war correspondents are paid, how technologies such as iPhones affect the job, and new insight on the danger of this work. The Encyclopedia of War Journalism, 1807-2015 offers unique, historical in-depth coverage of individuals and their accomplishments, along with experienced insight at how war coverage is linked to public opinion. This new third edition will prove invaluable to students of war, history, journalism, political science, and public opinion, as well as a general audience. 01 WHAT IS A SATPHONE?